No, this is an owl in clover. 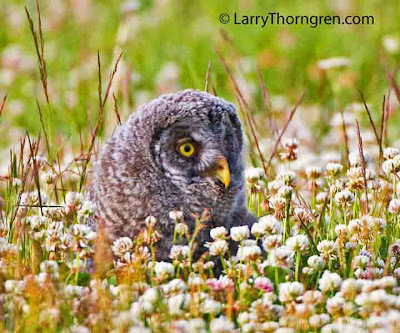 This young Great Gray Owl is sitting in a field of white clover after it attempted to steal a vole that its' mother caught there. The mother took the vole and fed one of her other offspring, leaving this aggressive young owl to wait its' turn. Great Gray Owls often hunt during daylight hours when they have hungry offspring to feed. They prefer cloudy days, but this owls' mother had to work all day long because she didn't seem to have a mate. I suspect that it may have been killed by an automobile, because they were located close to a busy road. I was amazed at the number of voles the mother owl was able to catch and feed her young while I watched. She hunted by sound and was able to drop on the voles without ever seeing them. You have given nice information about Great Gray Owls.I had not any idea about this informationthat they Thank you very much for providing such knowledge about Great Gray Owls.